c. to promote international relations and friendships among all ballooning nations and pilots. The winner shall be the team covering the greatest distance. The Coupe is organized by <* name of organizer *>. The Coupe is open to all NACs which have met their obligations to the FAI. Each NAC may nominate up to three balloon teams, each consisting of two pilots who must have the nationality of the NAC having entered them. The NAC must nominate the pilot in command for each aerostat entered, and this person will be responsible during the whole flight. He or she will be mentioned first in the official reports. 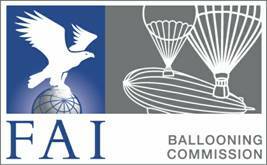 Both pilots must hold a valid license for balloon pilots and a FAI Sporting License issued by their NAC. Pilots must either hold a passport or an identity card from the country entering them. The pilot in command must have been authorized to be pilot in command of a gas balloon for at least twelve months prior to the start of the Coupe and must have had at least 50 hours experience as pilot in command and must be authorized to fly at night. At least one of the two pilots must be able to communicate with Air Traffic Control in English and have sufficient experience in operating the navigation aids. The entry fee for all participants is <* amount *>. The fee and the completed entry form must reach the organizer by the closing entry date (2.4). The entry fee includes <* list items included *>. The closing entry date for the Coupe is <* date *>. Pilots and their crews are required to know, understand, accept and abide by the Sporting Code and the rules and regulations for the Coupe. By entering the Coupe the pilots waive any right of action against the organizer, the owner of any site and their respective members, employees or personnel for any loss or damage sustained by him in consequence of any act or omission on their part or on the part of other pilots. The organizers reserve all rights concerning media reports and the selling of balloon mail and all other products. Pilots must provide proof that their balloons are insured for at least <* amount *> for third party liability during the Coupe. Insurance can <* not *> be purchased from the organizer. For the Coupe a gas balloon is defined as an aircraft lighter than air, supported statically in the air, with no means of propulsion by any power source and which obtains the buoyancy solely as a result of the difference in weight of the lifting gas and the surrounding air. In modification of the 1980 Rules, Article 6, only gas balloons with a maximum capacity of 1000 cubic meters may participate in the Coupe. A tolerance of 5% is allowed. Organizers are empowered to inspect any aerostat that they suspect is in violation to this rule. Aerostats flown in the Coupe must have current certificates of registration and airworthiness, or in place of the latter, an equivalent document from the recognized authority of the nation concerned. The organizers are empowered to reject any aerostat which in their opinion is not of a reasonable standard of airworthiness. Pilots may enter balloons hired in another country. Each balloon must bear the national flag of the pilot’s country, not less than one sq. meter. Transport of the balloon to the starting field in <* name of place *> and after landing to the home city of the balloon is at the expense and responsibility of the pilots. Balloons should be at the starting field by <* date *>. Additionally, each balloon will carry a GPS logger/tracking device provided by the organizer. Organizers shall not publish information regarding balloon altitudes during the flight. There is no restriction in the use of navigation aids and flight control instruments. Every balloon should be equipped with sufficient oxygen and appropriate distribution system to be used at altitudes greater then 12,500 feet MSL. Faulty barographs or altitude recording device may be penalized under rule 6.4.. In case of suspected altitude violations, barographs or backup altitude recording device (GPS) may be checked. Each balloon should carry a backup GPS that would constitute a back-up tracking log in case of tracker failure. Every balloon must be equipped with a filling hose 20 meters long with the necessary amount of sand bags for inflation and flight. At launch each balloon must carry at least 20 liters of water for ballast over airports, highways or other sensitive areas. The official competition map will be the <* name of map *>. The competitors are responsible for making their own arrangements for balloon meisters. The race is a First Category Event of the FAI and consists of a distance flight. The final classification will be based on the greatest distance covered. The distance will be measured by determination of the arc of the great circle in accordance with the General Section of the FAI Sporting Code. The nationality of the team who wins the race determines the NAC which will hold the Coupe the following year. The preliminary race results will be published within 24 hours after the command center has been notified of the landing of the last balloon. All flights will be carried out under Visual Flight Rules. Weather permitting the balloons will launch on <* date *> after <* time *>. . A delay to <* date *> may be used if necessary to assure a safe and successful race. The order of departure will be decided by two separate draws according to Article 8 of the General Rules (1980). In clarification of the 1980 Rules, Article 8 All balloons will launch within a time window fixed by the Director. As a guide, balloons will be launched at intervals between three and five minutes as long as it is safe to do so. Launchmaster will give each crew permission to launch. Permission to launch does not relieve the pilots of complete responsibility for his take-off, including adequate lift to clear all obstacles and other balloons and to continue safely in flight. If a pilot is not ready for take-off at the appointed time, he shall move to the end of the launch order. Pilots must be familiar with and abide by the applicable aviation regulations of the countries. Pilots may be required to log all ATC clearances given enroute; these must be returned to the Event Director in a sealed envelope for investigation is case of suspected violations. Infringements of Aviation regulations are in the first instance a matter between the pilot and the Aviation Authorities. If the Director receives information from an Aviation Authority that air law may have been violated, he should investigate and take action as appropriate. Penalties will be based on the FAI Sporting Code, General Section. In a case where a technical infringement of the rules or failure to comply with requirements caused by mistake or inadvertence has occurred and no advantage has been attained, the competitor concerned will, as a guide, be penalized by a reduction of not less than 2% of the best distance. Serious infringement, such as dangerous or hazardous actions or repetitions of lesser infringements will be penalized by a reduction of not less than 5% of the best distance. Unsportsmanlike , behavior including falsification of documents or repeated serious infringements of rules will result in disqualification from the Gordon Bennett race or a reduction in distance. The point of landing will be defined by the geographic co-ordinates in degrees and minutes longitude and latitude. Other evidence is to be considered if necessary. Landing position shall be telephoned to the Command Center within four (4) hours of landing. The Event Director should grant an extension in case of extenuating circumstances. An observer is a competition official responsible to the chief observer. His duties are primarily the impartial recording of particulars of positions, times, distances etc. achieved during the flight. He also has the duty to report any apparent infringement of these rules or of air law, and any case of inconsiderate behavior towards landowners or the public by any competitor or crewmember. At the General Briefing an observer will be appointed to each team. An observer may not assist the competitor with advice at any time. He should not attempt, and is not qualified, to amplify, explain or interpret the rules to a competitor. If he wishes, and is invited by the competitor, he may assist in the ground handling and inflation. The observer will occupy a seat with a window in the retrieve vehicle. He may not drive the vehicle. He may assist with map reading during the retrieve if asked to do so by the crew, and at their responsibility. It is the duty of the pilot and crew to convey the observer back to the competition center after measurement of the landing point and recovery of the balloon. In the event that the team does not return to <* location of event *> immediately after landing, they may convey the observer back to the competition center by public transportation. The sealed barograph (or trace which has been removed from the barograph in the presence of the observer) and the landing report should be returned with the observer. The cost of food and lodging and any transportation for the observer is the responsibility of the pilot. Complaints concerning any matter should be made to the Compitition Director at the Competition Center. Complaints should be in writing in English and will receive a written reply. If dissatisfied with the Compitition Director’s reply to a complaint, a competitor has the right to make a protest to the International Jury. Protests should be handed in at the Competition Center to an official who will record the time of receipt. Protests shall be accompanied by a deposit of <* amount *>. A competitor presenting a protest may make a verbal presentation of his case in addition to his written statement. The verbal presentation may not exceed fifteen minutes, except by leave of the Jury. A competitor not fluent in English may be assisted by an interpreter. The deposit will be returned only when the protest is upheld. The time limit for complaints and protests is 10.00 hours on <* date *> or four hours after publication of official results, whichever is later. Protests must be handed in within two hours of reply to a complaint. 10.1 The balloon and other property of a competitor shall be at the risk of the competitor at all times. By entering the Coupe a competitor agrees to waive all claim for injury to himself or loss or damage to his property. 10.2 By entering the Coupe a competitor assumes all liability for injury, loss or damage to third parties or their property and agrees to indemnify the organizers in respect thereof. 10..3 A competitor remains completely responsible for the safe operation of his balloon at all stages of inflation, launch, flight and landing. He must ensure that his equipment, his crew and his own level of skill and experience are suitable for the conditions in his own judgement. 10.4 All meteorological reports and forecasts and other safety or navigational information is provided in good faith for the guidance of competitors. Officials will be appointed to regulate the inflation and launching of balloons. With a view to maintaining the tradition of the free balloon race entrusted in 1905 by Mr. James Gordon Bennett to the Federation Aeronautique Internationale, it is agreed that the challenge will continue to be run under the name of “Coupe Aeronautique Gordon Bennett”. This challenge, which will be a distance race, shall conform with the FAI Sporting Code and the provisions of the present rules. Only the General Conference of the FAI, on recommendation from the International Aeronautical Sporting Committee, may amend the present rules. It is the responsibility of the NAC holding the challenge to organize the competition in its country. However, if for any reason this NAC renounces its prerogative, the FAI may entrust the organization of the event to another NAC. A preference will be given to the previous holder. If the holder renounces the organization of the race, it should inform the FAI Secretariat within two months following the competition in which it was the winner. The organizing NAC shall inform the FAI Secretariat of the new competition six months in advance of the date of the new competition. The NAC organizing the race shall be responsible for all costs of the event. Only NAC members of the FAI shall be able to participate in the race for the Challenge Cup. They may not enter more than three balloons each. Only gas balloons with a maximum capacity of 1200 cubic meters may participate in the Challenge Cup. A tolerance of 5% is allowed. All balloons, whatever their capacity shall be filled with gas having the same specific weight and the same chemical composition. Pressurization of the balloon to maintain a constant density altitude shall not be permitted. During the entire duration of the race, the crew for each balloon shall be composed of no less than two persons. The pilots shall be of the nationality of the NAC having entered them. The first balloon of the third NAC; etc. The second balloon of the third NAC etc. until all balloons have taken off. The final classification will be based on the greater distance covered. The distance shall be measured by the determination of the arc of the great circle, in accordance with the General Section of the FAI Sporting Code. The organizing NAC shall publish the special rules at least six months before he date of the race. f) any other important information. The organizing NAC shall decide on the awarding of the Challenge Cup. The results shall in principle be circulated within 15 days after departure. The prize shall be given to the winner in the month following the publication of the results. The NAC whose team wins the race will be the holder of the Challenge Cup for one year. An NAC shall become the final holder of the cup after winning three consecutive races. For the race to be considered as valid a minimum of three countries shall be entered. If an NAC holder of the Cup disappears or ceases to be a member of the FAI, the Challenge Cup shall be handed over to the FAI Headquarters. The NAC which becomes the final holder of the challenge cup has the right to offer a new Cup. If within one month this NAC has not informed the FAI of its intention to use this right, the FAI may accept a new Cup from another NAC or another source.